How do you work smarter, not harder? Family & Consumer Science Teachers work harder than almost any other teacher, in my opinion, for many reasons. First, we have a lot of different preps that core subject teachers often do not have. Many of my core colleagues teach the same 2-3 preps all day long while I typically have 5. I know many of you have significantly more! Secondly, if you teach a foods class of any kind, you have additional planning and prep along with grocery shopping to squeeze into your day or week. I don’t know about you, but I am at the point in my teaching career that I would like to work smarter, not harder regularly so that I’m not only sane by the end of the day or week, but still have some patience and energy left to deal with anything that comes up at home or with family. And finally, not spend what seems like every waking moment of evenings and weekends dealing with school work whether it be planning, creating or grading. Since most of us learn best from each other, thus this new feature! Ideally, I’d like to continuously update this post, as well as pose other questions, that inquiring teachers, experienced or inexperienced, may have. 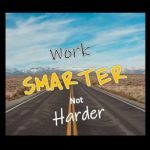 I started by including responses I got from a Facebook post, but for this to really work, I’d love to hear from all of you and how you work smarter, not harder! Let’s help each other be more efficient in the classroom! You can share in the comments below or email me at kim@familyconsumersciences.com and I’ll update the post as new information is shared. Additionally, if you have a burning question that you would like me to pose to other teachers, share the same way and I’ll create a post.